You might have tried jujube either fresh or dried. Jujube (Korean date) is called Daechu in Korea. Fresh ones taste like a mini apple, crunchy, sweet and slightly sour. Dried ones are commonly used in Korean herbal medicine since they are anti-inflammatory, anti-bacterial, antioxidant and are believed to alleviate stress. How to use dried jujube? You can make a jam or tea with dried jujube, cinnamon and honey, which I used to drink when I have coughing and flu symptoms. Add into a chicken soup to add more flavour or use in baking muffins and cakes. Korean jujube is definitely not as sweet as the dates you normally use, so add more of them or other sweeteners like honey, maple syrup or stevia. 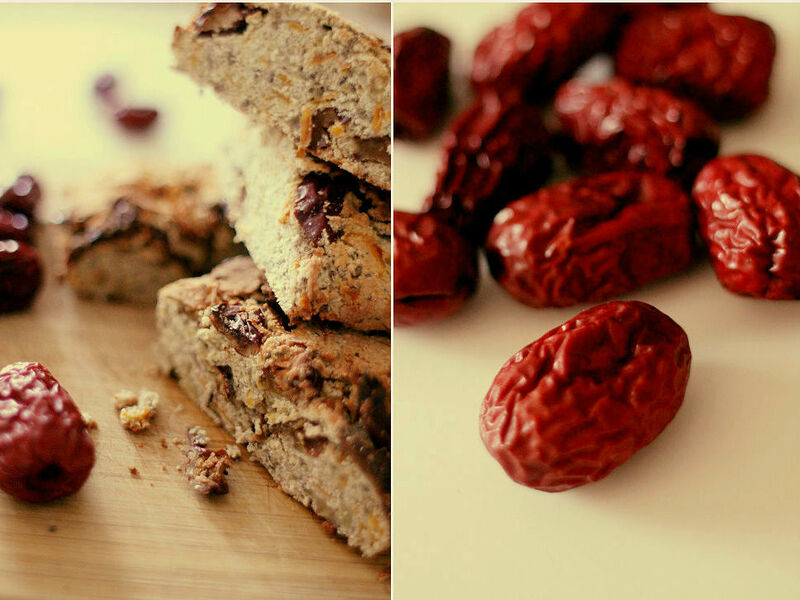 Soak dried jujube in chai tea for 10-15 minutes to rehydrate them. In the mean time, mix grated carrot, meshed banana, tahini, eggs and honey in a large bowl. Drain, (preserve some of the tea), deseed and roughly chop the jujube. Add them into a bowl along with chia seeds, cinnamon, baking powder and almond meal. If the mixture is too dry, add a little bit of preserved tea. Combine well with a spatula and transfer to a loaf pan. Bake in the preheated oven (180) for 30-40 minutes or until cooked. Allow to cool and enjoy.